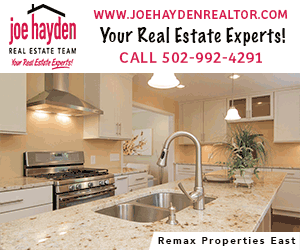 Are you looking for a farmers markets in Louisville? It’s a great way to shop for fresh, unique items and support local farmers and feed your family real food! 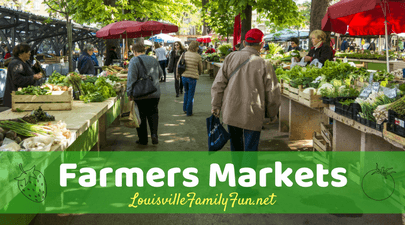 Louisville area farmers markets offer a wide variety fresh foods and other locally made goods. Check out the farmers markets in your neighborhood or venture to across town or even across the river! Beechmont Open Air Market (The Corner of Southern Parkway and Wellington Ave): Open every Saturday from June 9th until the end of September from 8:00am-Noon. Crescent Hill Farmers Market (The corner of Frankfort Avenue and Peterson Avenue): Friday mornings from 7:00am to 10:00am. Douglass Loop Farmers Market (2005 Douglass Blvd): Open March-December from 10:00am-2:00pm. East End Farmers Market (in the parking lot, 13060 Factory Lane. 40245): Open Every Tuesday & Saturday 2:30 to 6:30pm. Fourth Street Live! Farmers Market (400 S. 4th Street): Every Wednesday from May 9th – October 31st from 11:00am-2:00pm. Gray Street Farmers Market (400 block of E. Gray Street, between S. Preston and S. Jackson streets): Open Thursday from May 17th-October 25th from 10:30am to 1:30pm. Jeffersontown Farmers Market (10434 Watterson Trail): Open Saturdays from May 5th-October 27th from 8:00am-12:30pm. Louismill Anchorage Farmers Market (12102 La Grange Rd): Saturdays from 8:00am-Noon. Lyndon Farmers Market (7515 Westport Rd): Fridays from May-October from 3:00pm-6:00pm. New Albany Farmers Market (202 E. Market Street): Open Saturdays May 13th- October from 8:00am to 12:30pm. Beginning June-August will also be open on Wednesdays from 3:30 to 6:30 pm at City Square and at Baptist Floyd Hospital on Tuesday from 11:00am to 1:00pm, and at the WIC office behind the hospital on Thursday from 3:00pm to 6:00pm. New Goshen Presbyterian Church (12900 W Highway 42): Open Saturdays June 2nd – August 25 from 9am – 12:30pm. The Original Bardstown Rd. Farmers Market (1722 Bardstown Rd): Open Saturdays year round from 8:00am-12:00pm. Phoenix Hill Nulu Farmers Market (1007 East Jefferson): Tuesdays from May 24th – October 25th from 3:00pm to 6:00pm. St. Andrew’s Farmers Market (2608 Browns Ln): Thursdays from May 11th – Mid October from 3:30pm-6:30pm. St. Francis of the Fields Farmers Market (6710 Wolf Pen Branch Rd. ): Tuesdays from 3:00pm to 6:30pm and Saturdays 9:30am to 1:00pm. St. Matthews Farmers Market (4100 Shelbyville Road): Every Saturday from May 12th – September 29th from 8:00am to Noon. South Point Farmers Market (4148 Taylor Blvd): Sundays from May 7th- September 24th from 10:00am-2:00pm. Westport Road Baptist Farmers Market (9705 Westport Rd): Open from April 28th-October 27th from 9:00am-1:00pm.